Rather than running Cobbler with the default Apache2 installation, below details how to serve Cobbler's WSGI Python services via NGINX's uwsgi_pass. This details the setup on CentOS 7. The latest version of Cobbler can be installed from the EPEL repository on CentOS 7. First, be sure EPEL repos have been enabled, then install Cobbler and its friends. 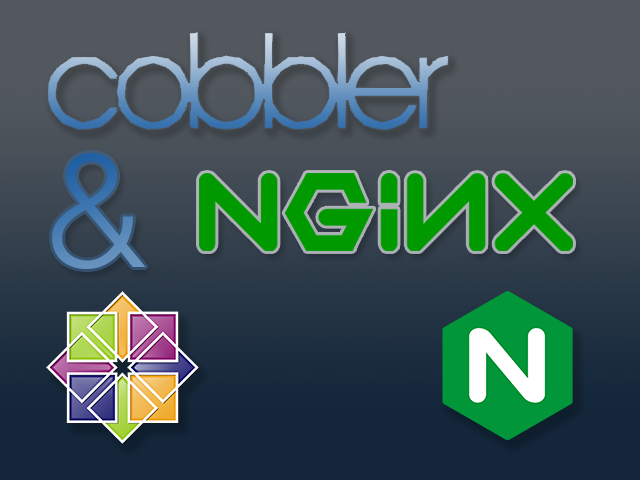 This guide is only focused on getting Cobbler WebUI working behind NGINX— full configuration of Cobbler, dnsmasq, and so on, is outside the scope of the article. NGINX can be installed from source, or via a package. I typically compile the latest version from git, but it can also be installed from the EPEL repos. This setup assumes that NGINX is configured to run as user www-data. If this is not the case, then be sure to modify the uWSGI configuration and Cobbler file ownerships as necessary. Failure to do this will result in the WebUI being unusable. The default Cobbler package in EPEL for CentOS 7 ships with a default owner of apache (all of my other servers use www-data, so I have chosen to change it to match that convention). If all is well, reload (or restart) NGINX to pull in the new config. Install latest uWSGI via pip, then create a directory for our config files. Fault 1: "<class 'cobbler.cexceptions.CX'>:'login failed'"
Fix ownership of the web.ss auth file and webui_sessions. Failure to do this will result in a 500 error with the above error message. ExecStartPost=/bin/bash -c "/bin/sleep 5 ; /bin/chown www-data.www-data /var/lib/cobbler/web.ss"
Alternatively, open /usr/lib/python2.7/site-packages/cobbler/cobblerd.py, find the line reading http_user = "apache" (line 65 in my version of cobblerd.py), and change it to http_user = "www-data". This may not be a good solution, as your changes may get overwritten during updates. Next, we need to create systemd manifests. After starting the services, visit https://cobbler.example.com/cobbler_web and enter your credentials to login (or cobbler/Cobbler if you haven't configured authentication yet).